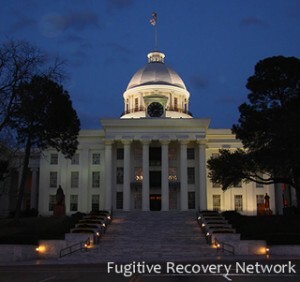 Below is basic information on bail bond laws for Alabama concerning Bail Enforcement, Bounty Hunters, Fugitive Apprehension and Bail Bondsman. This is not legal advice. Laws change frequently, please check the links provided for possible updates and current information. Code of Alabama , Title 15: Criminal Procedure, Article 13: Bail. The Department of Insurance is the regulatory body. Be a resident of the State of Alabama. Have a sufficient financial net worth to satisfy the financial obligations which to enter into as a surety, taking into consideration all other outstanding obligations and liabilities. Not been convicted of a felony or a crime involving moral turpitude. Have no outstanding final forfeitures arising out of any surety undertaking. Bail companies must furnish a bond with corporate surety in the amount of $25,000.00 ($10,000.00 in Cullman County), to be approved by the probate judge of each county in which such person engages in such business, conditioned to guarantee the payment of all sums of money that may become due the state or any political subdivision thereof by virtue of any judgment absolute being rendered against such person on a forfeiture of bail. File an original qualifying power of attorney, letter, or other document issued by the professional bail company specifying any applicable limitations and specifying the agents who are authorized to execute and bind the professional bail company to a bail undertaking or to appearance bonds. The qualifying power of attorney, letter, or other document may only name persons as agents. Alabama Bail Bond agent’s arrest authority. Alabama does not have provisions regarding bounty hunters. Please check with the Alabama’s Department of Insurance, Licensing Board and Local Law Enforcement for the most recent updates. If you know of any updates to Alabama’s bail bond laws, please provide as much detail as possible and send to us using our contact form.